Convert between different units of time. The translate object converts from any of the fixed or relative Max time values to any other fixed or relative time value. time-formats symbol opt Arguments set the time formats to convert between. The first argument sets the input format to expect, and the second argument sets the format to output. These arguments are a shortcut for setting the attributes of this object which do the same thing. Time can be specified in any of the time formats used in Max. bang The last time-value passed in is converted into the output type specified. Where appropriate, the input type of the last time-value passed in will be re-assessed by checking the in attribute. The time value passed-in is converted into the output type specified. Where appropriate, the input type will be assessed by checking the in attribute. in symbol The input format is used to determine the value sent to this object when the value alone is not enough. For example, a simple number could represent milliseconds, hertz, ticks, seconds, etc. This attribute is used to disambiguate such cases. listen int Toggles the output of new values for the current input to the translation when the transport tempo changes. The default is 1 (on). mode symbol Sets the mode for time values. 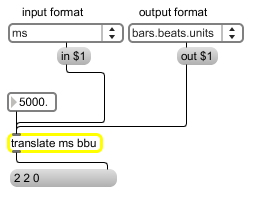 The translate object can output time values in either position relative to the system start value of 1.1.0 or interval , where a value of 1.1.0 would indicate one bar, one beat, and no units (2400 ticks at 4/4 in the default resolution). Note: this attribute may not apply, depending on the type of unit conversion. out symbol Set the time format to use for output. transport symbol The name of a transport object with which to associate. By default, the master transport is used.